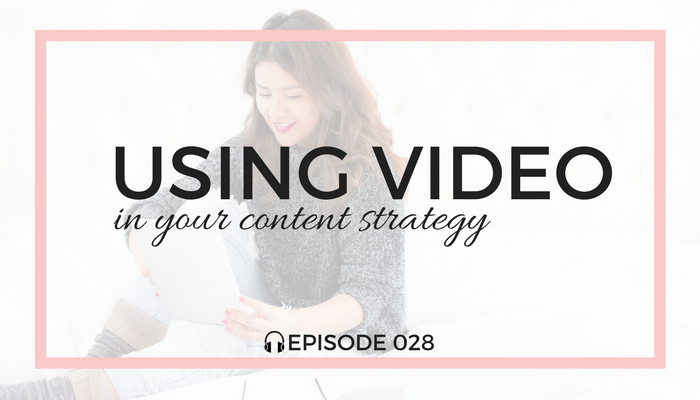 If you learn nothing else from this episode, know this: You should be using video in your content strategy! Video content is HUGE, both on a blog and on social media, and don't even get us started on the power of YouTube! We are both in love with video content, so this week's episode is full of juicy nuggets to help you get started with video and help you create a video content strategy. Pinterest introduces the Lens feature. Facebook emojis can boost your posts in the news feed. BOTTOM LINE: YOU NEED TO BE DOING VIDEO, particularly on social media!!! Get over your fear of going live. It's unscripted and raw, which makes it appealing. It makes you more authentic and trustworthy, and if & when things go wrong, how you handle those things live shows your character. You've got Periscope, Snapchat, Facebook Live, Instagram Stories, and Instagram Live, to name a few. Find your platform where your audience hangs out and spend your time there. Keep in mind that Instagram Live disappears as soon as the broadcast ends. Is it worth it? That's a personal decision. Recording a video is not time consuming. Editing the video can be time consuming. Don't make the excuse that you don't have the right equipment. You can get started with a cell phone. Erin's Pro Tip: Search on YouTube for "How to Shoot Low-Budget Films" to see what they use to get quality audio, video, and lighting on a budget. When recording video, schedule dedicated recorded time and block out all possible distractions. Clean up your background, pay attention to your surroundings and try to take advantage of the windows of opportunity when you have them. Create a scheduled weekly show where you go live each & every week, then announce it to your email list & social media followers. Please acknowledge and engage with the people who show up and talk to you when you are broadcasting live. Editing video is much easier on a Mac, so if it's going to be a big part of your marketing, it's worth it to invest. It's more difficult and clunky on a PC. iMovie makes editing video a breeze! For PC users, try Filmora for video editing. For screen sharing videos, we recommend QuickTime and Snagit by Techsmith. Creatively use live streaming videos, like my friend Allyson from Domestic Superhero who cooks a week's worth of recipes each week on her Facebook page. PRO TIP: Sit up straight & tall, filling the screen AND look into the camera, not at yourself. OUR CHALLENGE TO YOU: Do a live video on Facebook or Instagram and use #BlogFuel. We'll come give you some love and encouragement! CLICK HERE to add your photo to our community folder! We want YOU on our podcast website!! If video is not yet part of your content strategy, stop whatever you're doing and listen to this episode! You need to be using video in your content strategy, friend! Erin & I break down creative ways to incorporate video, and offer tips to get over your fear of LIVE video!